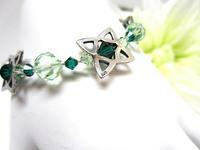 Put on this four leaf clover bracelet when nothing will do but the wearin' o' the green. There's not just one, but TWO (count 'em) shades of green in this Irish beauty. Swarovski Crystal's crysolite (yes, they spell it that way) colour is every bit as feminine as their emerald colour is dramatic; so the two play off each other rather well. 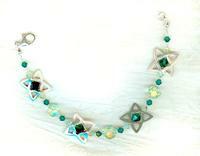 The sterling silver bead frames made me think of four leaf clovers, what with their curved corners and all. The four leaf clover bracelet measures a dainty 7-1/4", and closes with a sterling silver lobster claw. 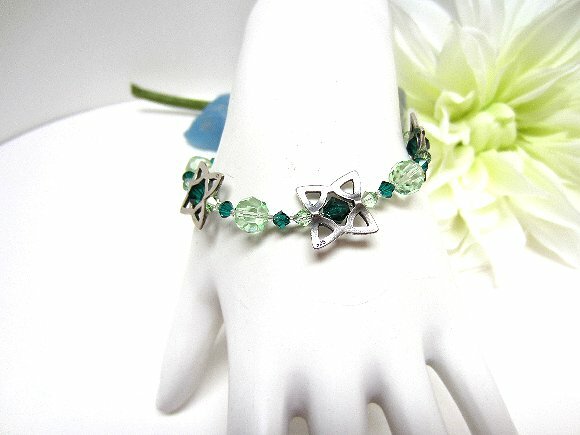 Now there's fine way to celebrate Patrick's Day (or any other time, for that matter)!It's the one and only Four Leaf Clover Bracelet, and it's from SPARKLE PLENTY.